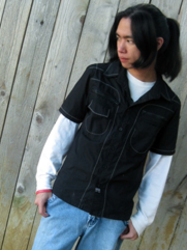 Despite his ponytail and general inability to fly, Micah Solusod is a professional voice actor and illustrator. The rapscallion made his anime debut as Malek Werner in Blassreiter and is best known for his role as Soul Evans in Soul Eater. He has shown up in a number of other FUNimation titles as Toma Kamijo in A Certain Magical Index, Mizuki in Kamisama Kiss, older Ame in Wolf Children, Midnight in Fairy Tail, teen Coby in One Piece, Bea in Space Dandy, Yukine in Noragami, and most recently, Tagoma in Dragonball Z: Resurrection 'F'! Currently, he can be heard in FUNimation's Broadcast Dubs as Yuichiro Hyakuya in Seraph of the End, Black in Blood Blockade Battlefront, and Su-Won in Yona of the Dawn. Micah also makes appearances in Dragonball Xenoverse, Atari's Centipede: Infestation, Borderlands 2 and Borderlands:The Pre-Sequel. It's likely he's done more but who's counting? When he's not busy posting unhelpful voice acting tips on Twitter, Micah works as the lead artist for the webcomic Ties That Bind and can be found on the internet under the username "maioceaneyes". Believe it.